DJ Dre Music and PhotoBooths, With over 17 years of experience, I have the knowledge and skill to perform at your wedding or next event. I'm a highly recommended DJ with a fun personality and very energetic and I know with the right music chosen and with your energetic guest, that will determine how successful your event will be. With a passion for all genres of music I take pride in providing great music for everyone from young to old, with music selections from the 60s, 70s, 80s, & 90s to the Top 40 hits of today we can have a great time. With free consultation & references upon request I enjoy meeting with every client to cover every detail to make sure you receive the professional service and that your expectations are met. I took an interest in music from my dad who introduced me to a variety of different music at a young age from such genres like Motown, Oldschool, R&B & Hip Hop, Classic Rock, 70s & 80s , Disco and much much more. In my teenage years I landed a job as a Disc Jockey at the local skating rink playing some of those same songs you and I may have grew up on and still like to party off of today. Not long after that I started my own DJ Company DJ DRE Your Source For Music. I Hope to Party with you soon! "This Company was Excellent!! my wedding was on May 20th, 2017 and the Dj had our wedding guest dancing and having a great time! He was on key with all the music we requested. I would definitely recommend this company to anyone who is having an event!" "DJ Dre made our night the party we wanted! my wedding was on May 20th, 2017 and our Dance floor was never empty all night. any quick changes went smoothly and we can't him enough. " "We had the Pleasure of having Dj Dre and the PhotoBooth for our wedding. he kept everyone dancing the whole night. the PhotoBooth was a such a success and everyone loved the idea. people are still talking about how much our wedding was! " "Jul 11, 2016 by Kristin Goleski on DJ Dre Music and Photobooths Fun and easy to work with. I honestly gave him a few songs I liked and he caught my music taste right away. I didn't have to right down the entire playlist I gave him free range and it was fantastic. The photo booth was a big hit all of our guests enjoyed it and both him and his assistant were so nice and helpful. I can honestly say he made the night PERFECT defiantly amazing people to work with"
"Jul 12, 2016 by Michael Amenta on DJ Dre Music and Photobooths He was awesome he was on time very professional and played all the music we liked thank you DJ Dre and we will recommend him to anyone that needs a DJ"
"Aug 21, 2016 by Kate Kroe on DJ Dre Music and Photobooths We met twice before the wedding and he was very professional and accommodating and offered a fantastic price. He was great at the reception and able to play all the music we requested. He kept everyone on the dance floor and we got so many compliments on how good the DJ was. The photo booth was so much fun and the pictures came out great. Andre even delivered the discs with a slideshow and each individual picture right to our apartment after we got back from our honeymoon. 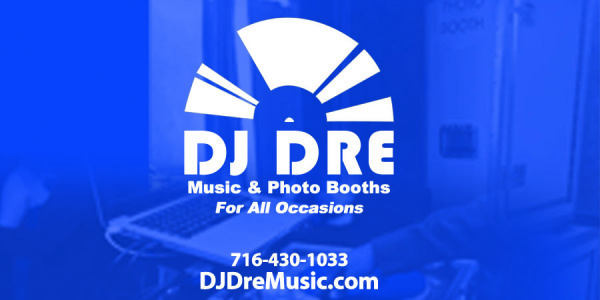 I highly recommend DJ Dre Music & Photo Booths for your event!" "Aug 26, 2016 by Sheri Walling on DJ Dre Music and Photobooths He played my requests and kept people on the dance floor. He made everything go so smoothly and was very professional. The uplights he provided and set up were so beautiful. We also got the photobooth which we received so many compliments on how nice it was. Everything was well organized and the photobooth book turned out amazing! I would highly recommend Dj Dre's services. I couldn't have asked for a better night. Thank you Dj Dre!" "Sep 12, 2016 by Alyssa Johnston on DJ Dre Music and Photobooths We met once before the wedding when he offered to drive out to Rochester to meet us. (We live out of town) We covered almost all the details on our first meeting, then he called me two or three more times to confirm all of the details. The night of the reception, he and attendant showed up to set up the DJ table and photobooth! Everyone loved the two of them, and the great props and the amazing music! He adjusted to the party and their type of music. There was a great balance of slow/fast songs as well as classics/modern day music! Everyone was dancing, in their sits and on the dance floor! Andre cared about every detail along with his customer service level. There aren't enough words to describe how awesome it was. I would definitely give Dre a call for your event!" "Our Wedding was on 10/1/2016 with DJ Dre spinning the music. OMG!!! He had the crowd JAMMIN!!!. Thanks DJ Dre for a Beautiful Day because without the music, there would be no Party. He played the music we requested and kept the party lively... We also had the PhotoBooth set up, which kept our guest entertained besides the music and dancing..." GREAT CELEBRATION"!!!" "He was very prepared and efficient with his work. My husband and I are very happy we chose Andre to share in this experience with us. He was very professional, and gave us more than our money! Even with request, he checked with us first to make sure we approved of the music. I would definetly recommend for anyone's wedding, party, anniversary, etc etc. Thank you so much for your service, and professionalism!!" "I really Appreciate the Professionalism and Entertainment for my wedding and reception it was wonderful. 8/7/15"
"Dj dre was Awsome!! he kept our intimate crowd jumping!he took request and kept the music to our taste, I would recommend him for any event, Thank you DJdre!! 8/21/15"
"Djdre was Awesome!!! and very Professional & a pleasure to work with, Absoluty Phenomenal you did an awesome job Thank you ,Thank you, Thank you. 6/27/15"
"Thank you so for sharing in or special day, the music was on point!!! you were very professional and yes we will recommend you Thanks Djdre for a wonderful time." "Amazing! Awesome! Tore the floor up! Sooo Pleased! Thank you so much for a great time DJing our wedding on 8/31/14. You kept the Dance floor Jumping all night, which is exactly what we wanted! you were great to work with and helped our wedding be a success! " "Dj Dre was the perfect choice for our wedding!He played a variety of Music for everyone. He was always Professional and organized and well prepared for the night. he kept everything flowing throughout the night. Dj Dre will always be our go to Dj for any future events. we are glad we had the opportunity to work with Dj Dre and we Appreciate all that he Did. "